Ensign Edward L. Scharch A-V(N) Photo taken on day he received his commission as Ensign, A-V(N), USNR at NATC Pensacola Florida. On October 29, 1942, Ed enlisted in the U.S. Navy and was accepted into the Aviation Cadet (AvCad V-5) by the Naval Aviation Cadet Selection Board at Chicago, Illinois. Placed on inactive duty, he was sent home to await orders. In December 1942, on detached duty, he reported for the civilian pilot training program (CAA-WTS) at Carroll College in Waukesha, Wisconsin. He successfully completed the Navy's program requirements on February 22, 1943, and again he was sent home to Milwaukee to await instructions. He was officially designated a Naval Aviation Cadet (V-5) when transferred to active duty, then he reported to Naval Pre-Flight School at Iowa City, Iowa on May 6, 1943. NPFS was a ground school only, which did not provide any flight time. The program was divided into equal sections of academics and physical training. AvCads were required to pick an athletic competitive sport as an important part of their development. Choices included football, basketball, track, etc., Ed Scharch chose boxing and won a few of his bouts. Following his successful completion of NPFS Iowa, Ed reported to NAS Minneapolis on July 28, 1943. In the skies over the Twin Cities, he flew and soloed in his first Navy plane. The N2S Kaydet "Yellow Peril" was an open cockpit trainer built by Stearman-Boeing. President Bush was at NAS Minneapolis six months earlier flying the same type of primary trainer, but in frigid winter weather from Nov. 1942 to Feb. 1943. Ed Scharch completed primary flight training on October 7, 1943, during Minnesota's warm months. A year after beginning his training, Ed reported to NATC Pensacola, Florida on October 26, 1943, arriving at the "Cradle of Naval Aviation" he underwent five months of intensive intermediate flight training. This is where he got his wings as a Naval Aviator and was commissioned an officer as Ensign on March 14, 1944. Note: Many of Ed's service records following graduation are missing - 379 days in all. He washed out of the program after a carrier landing accident and short hospitalization. He was given an honorable discharge on March 28, 1945. On July 26, 1945, he was drafted back by the Navy as an Apprentice Seaman. He was sent to USNTC Great Lakes and completed recruit training on September 4, 1945. 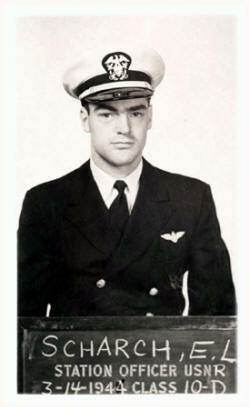 He was transferred to NAS Corpus Christi, Texas and served the remainder of his duty at NAAS Waldron Field. Ed was discharged from the Navy (a second time) on April 13, 1946. When he arrived back home, only his mother was around to greet him. He strolled into her kitchen and said, "Hi Ma I'm back... and I've got ten-cents left!" ENLISTMENT: in USNR for 4 years, accepted as AvCad V-5 USNR, placed on inactive duty. Age 18 years, 2 months; Occupation "Factory Helper", McCullough Superchargers, Milwaukee, WI (engine building, honing cylinders). INACTIVE DUTY: sent home to Milwaukee to await further orders. RECALLED: 01-Dec-42 to active duty for Civilian Pilot Training, and reported to NACSB for physical examination, indoctrination, and further assignment on or about Dec. 13, 1942 to Carroll College for detached duty. REPORTED 13-Deb-43 (Detached Duty) to Carroll College, Waukesha, WI for preparatory flight school and undergo civilian pilot training program (CAA-WTS). COMPLETED CAA-WTS program 22-Feb-43; ground school at Carroll College; elementary flight, soloed in Piper J-3 Cub at Spring City Flying Service at Waukesha Co. Airport, WI. Ordered to proceed to home at Milwaukee, WI. REPORTED: to NACSB. Transferred to Naval Pre-Flight School, University of Iowa at Iowa City, IA for pre-flight training. REPORTED to NAS Minneapolis, MN from NPS Iowa City, IA to undergo primary flight training. Night training said to been taken at Fleming Field, South St. Paul, MN (NAS Minneapolis, Area-B). COMPLETED primary flight training on 10/07. Final Flight Mark: 2.95, and Aptitude as Officer Mark: 3.46. 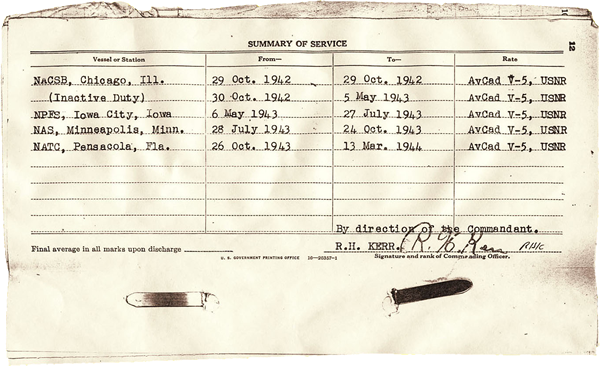 AUTHORIZED LEAVE: 7 days, from 10/15/43 to 10/22/43. TRANSFERRED: 10/24/43 to NAS Pensacola, FL from NAS Minneapolis. REPORTED to NATC Pensacola, FL from NAS Minneapolis, MN to undergo intermediate flight training. RELEASED from duty to accept commission as Ensign, A-V(N), USNR and Naval Aviator on 14 March 1944. NOTE: Unexplained gap in records for 379 days, from 14-Mar-44 to 28-Mar-45 discharge. Unexplained gap in service (379 days) from National Personnel Records Center. CIVILIAN living at home in Milwaukee following discharge as A-V(N) from USNR. INDUCTION: Received draft notice by US Navy, ca. June 1945, four months after discharge. REENLISTMENT: Reported to Naval Recruitment Station, Milwaukee, WI, SSLB #22 reenlisted for 2 years and accepted. Rate: AS, USN-I. TRANSFERRED: to NTC Great Lakes, IL from NRS Milwaukee, WI for reenlistment processing & recruit training. REPORTED: 26-JUL-1945 to USNTC Great Lakes, IL from USNRS Milwaukee, Wis. Rate: "AS, V6, SV." Application for N.S.L. Insurance submitted 27-Aug-45. COMPLETED Recruit Training on 04-Sep-45. Received instruction in following: Gas mask drill & chamber, Fire fighting school, Rifle range, Night lookout trainer. Qualified swimmer, "third class." ADVANCED to S2c (Seaman 2nd Class). Completed recruit training. Granted 5 days recruit leave. RECRUIT LEAVE: (Great Lakes) 5 Days, 4 Sep 1945 to 9 Sep 1945. TRANSFERRED: 02-Oct-45 for duty to NavAirTra Bases, Corpus Christi, TX from USNTC Great Lakes, IL. "AUTH: NAVAIRINTERMTRACOMD Ltr. Serial 5697 dated 21 Aug 1945." MARKS: Conduct 4.0. Rate (rank) S2c, Class SV6, USNR. REPORTED: 08-Oct-45 to NAAS, Waldron Field, Corpus Christi, TX from USNTC Great Lakes, IL. "Authorized to wear the American Campaign Ribbon". MARKS: 20-Dec-45, Conduct 4.0. Rate (rank) S2c, Class SV6, USNR. HOLIDAY LEAVE: 28-Dec-45 to 02-Jan-46, 5 Days, NAAS Waldron Field, TX. PROCESSING: 20-Mar-46: EL Scharch, S2c, SV6, USNR; "Has been interviewed and does not wish to reenlist in the U.S. Navy." Civilian Pilot Training; program held at select colleges and civilian airfields throughout the U.S. Naval Aviation Training Bases; usually contains auxiliary air stations or outer landing fields. Naval Aviator, or A-V(N), affords rank of Ensign as commissioned officer and pilot.